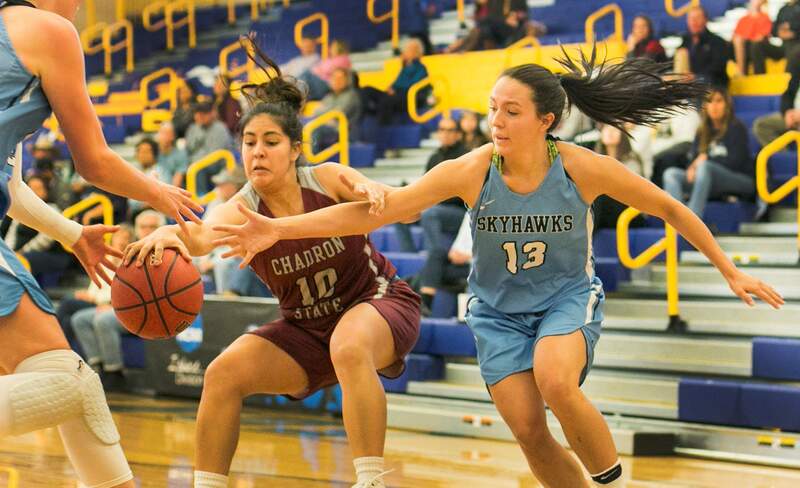 Fort Lewis College junior Kayla Herrera, a preseason All-RMAC selection, is expected to be a leader for the Skyhawks this season. They were picked to finish eighth in the RMAC’s preseason coaches poll, and the team is committed to proving them wrong. 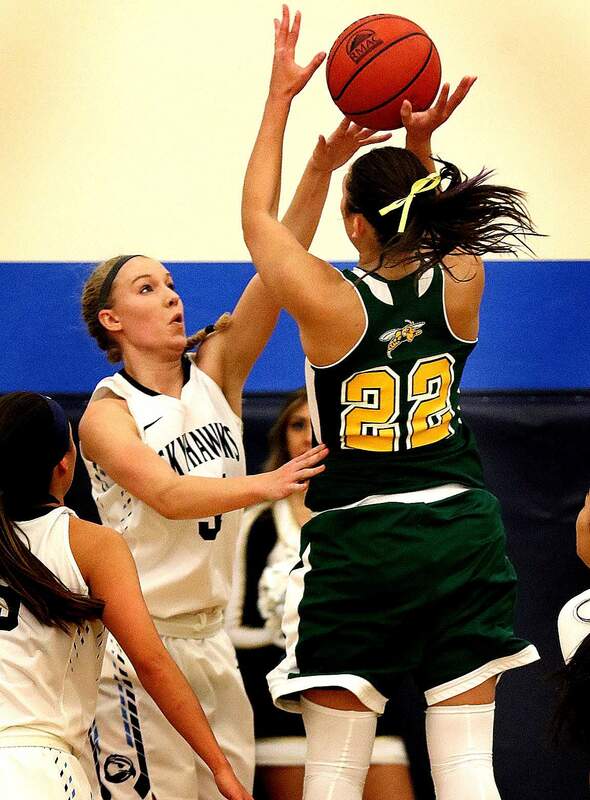 Forward Alyssa Yocky’s return gives the Fort Lewis College Skyhawks a dominant post presence and a player who can defend any position on the floor. 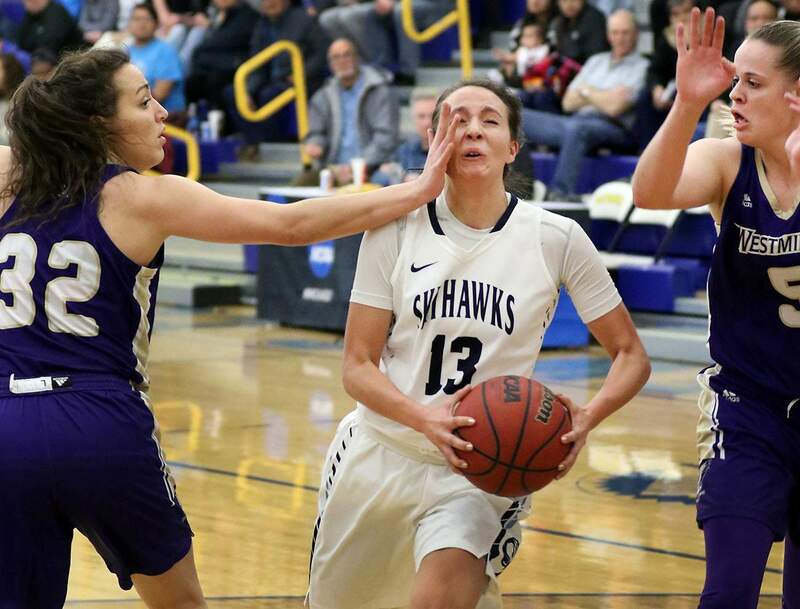 Fort Lewis College’s Kayla Herrera will look to lead the Skyhawks in steals during her junior season. Everybody in the Rocky Mountain Athletic Conference knows exactly what the Fort Lewis College women’s basketball team lost after last season. So far, only the Skyhawks know what they’ve gained. Prized recruit Vivian Gray departed FLC after her freshman season and transferred to Oklahoma State University, where she had 18 points and eight rebounds in her first exhibition game with the Division I Cowgirls. Last year, Gray was named the RMAC Freshman of the Year after she averaged 18.5 points and 7.8 rebounds per game. She also had 45 blocked shots, 42 steals and 69 assists in 24 games for the Skyhawks. The team started 15-1, but Gray and the Skyhawks faded down the stretch to finish 20-9 overall and 14-8 in conference with a first-round exit in the conference tournament. While Gray was a superstar talent, the rest of the team took a step back around her and actually finished with a worse record than the previous season and didn’t have the same fight as head coach Jason Flores’ 2015-16 team that reached the conference tournament championship game as the eighth seed. Minus Gray, FLC was picked eighth in the RMAC’s preseason coaches poll. A determined group of Skyhawks are ready to prove they’re better. “That’s where they picked us my (redshirt freshman) year too when we had some newcomers on the team, but we ended up proving a lot of people wrong,” said FLC junior Kayla Herrera, a preseason All-RMAC selection. “That team, we played with heart, aggression, energy. I have the same sense this year. The girls here are here for the same reason – we love the game and have fun playing. 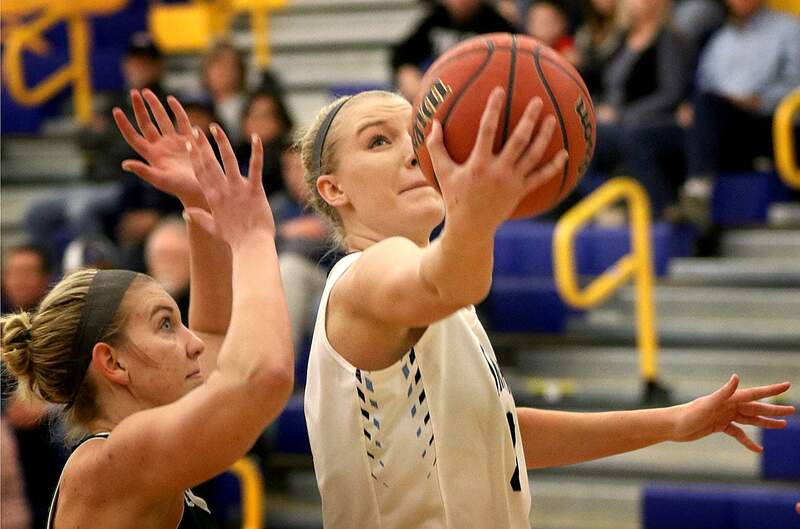 Fort Lewis College senior Alyssa Yocky is healthy again and hopes to match her sophomore season offensive numbers. Flores handed Herrera a leadership role going into the 2018-19 season, and she has thrived. At 5-foot-9, Herrera is listed as a guard, but she can play anywhere from point guard to power forward depending on who is on the floor. In her previous two seasons, she has averaged 11.2 points and 5.2 rebounds per game. Her numbers took a hit last year with Gray on the floor. Flores will ask Herrera to play point guard at times this year, something new for Herrera at the college level. She has developed a friendship with former FLC superstar Katerina Garcia. The 2013 FLC graduate is second all-time for FLC in assists and fourth all-time in steals. Herrera said she wants to live up to her legacy and bring the kind of success that Garcia experienced. “I was never a true point guard in high school, either,” Herrera said. “But, even in high school, coach threw me wherever I needed to be. When (Flores) asked me to be a point guard this year, I said, ‘Wherever you need me coach.’ It’s new for me to handle the ball for five to 10 seconds at a time, reading the floor, but I love that coach is giving me this responsibility. I love making plays. 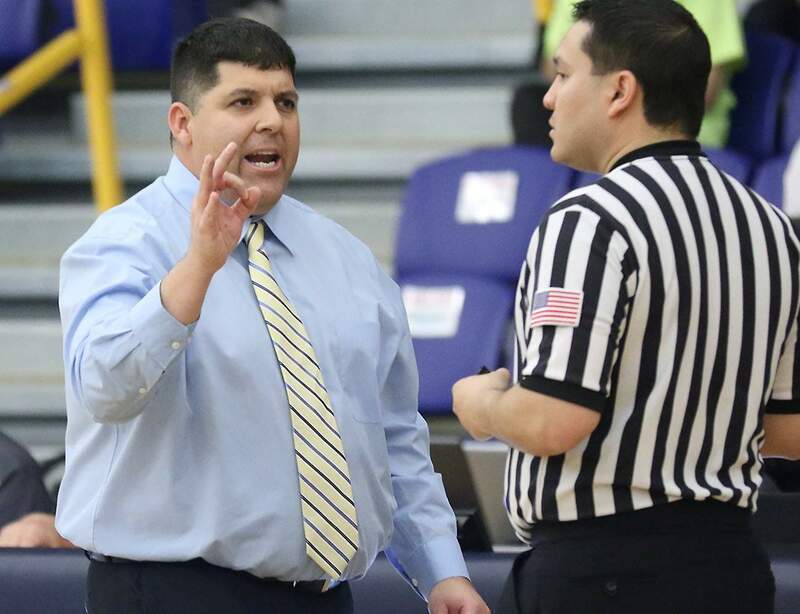 Fort Lewis College women’s basketball head coach Jason Flores is eager to blend a few experienced players with plenty of newcomers this season. Herrera is part of a large New Mexico contingent on the Skyhawks roster, with eight players from the Land of Enchantment. The group has formed a bond. Flores expects big contributions from the New Mexico talent, too. Sophomore guard Sydney Candelaria hustled all over the floor her freshman season and will see time at point guard this year. Hanna Valencia, who took a redshirt last season, will play this year after being part of multiple high school state championship teams at Hope Christian. Shiprock’s Tasnisha Begay has an ability to be a red-hot 3-point shooter, and junior guard Kaitlyn Romero brings experience to the floor. The team is also excited about true freshman guard Alyssa Adams out of Moriarty High School. Flores said Adams is highly competitive and is an attacker. “She’s a great shooter and works super hard,” said FLC senior forward Alyssa Yocky. “The skills she has now, I’m so excited to see how she grows and progresses. Yocky’s smile is back on the floor for FLC, and that provides a big boost to the Skyhawks in multiple departments. She’s a proven leader and was an All-RMAC talent her sophomore season, but a lingering injury kept her out the majority of her junior year. When she did return to the floor, Gray largely filled the role she held previously, and she never got comfortable on the floor last year. This year, the 6-foot post from Albuquerque will try to replicate her sophomore year, in which she averaged 12.5 points and nine rebounds per game. “It’s been a long time getting back into this,” she said. “It was hard last year trying to be a leader on the bench but not getting out there and leading by example. Once I was finally back out there, it wasn’t the same as before. I wasn’t completely healthy, either. It was hard to get chemistry back. Yocky will pair with 6-1 sophomore forward Jordan Carter in the post, giving the Skyhawks a pair of weapons in the paint. FLC is also excited about senior transfer Morningrose Tobey out of the University of Nevada. FLC showed well in an exhibition at Northern New Mexico and is eager to start the regular season at 4:30 p.m. Friday against Western New Mexico University in Portales, New Mexico. FLC will then play Eastern New Mexico at 7:30 p.m. Saturday in Portales. Flores said the direction of the season will largely be decided by how well all the new pieces come together the first month of the schedule.